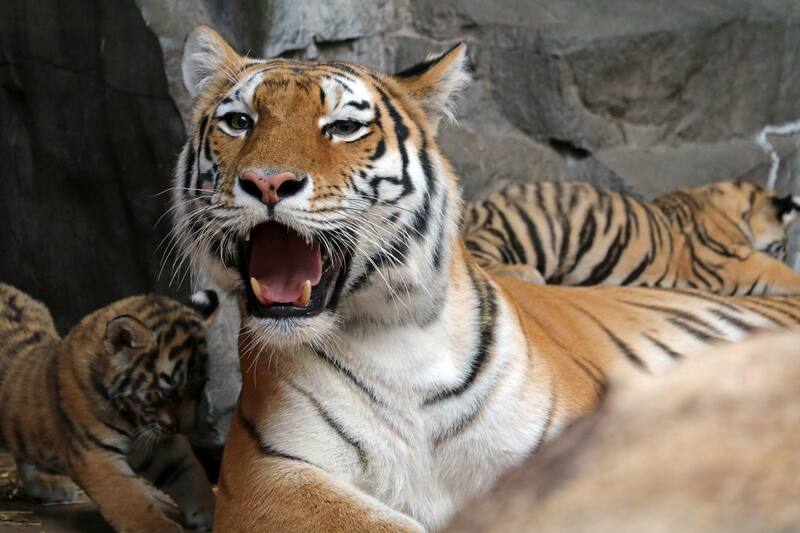 The Tiger Breeding Center will be an off-exhibit area with the capacity to hold up to six adult tigers. Sitting on about five acres of land, the site will include three different buildings, each with two rooms, two porches and two large outside yards. Each yard, made up of 10,000 to 12,000 square feet, will include large water features as well as elements tigers would find in their natural habitats. The most important aspect of the area is that the tigers will be secluded from the public, allowing the animals more privacy and the ability for Wildlife Safari Park staff to manage the breeding more intensely. Wild tiger populations have been declining to dangerously low numbers due to extinction threats like human conflict and poaching for the illegal wildlife trade. To save this cherished animal, numerous efforts approach the problem from every angle, from protecting tigers in their natural habitat, to ensuring there is enough stored genetic material to protect the species. Contributing to the second part of the equation, the Zoo, in partnership with the Association of Zoo and Aquariums’ Tiger Species Survival Plan (SSP), has been selected to participate in the Tiger Genome Project. To ensure enough genetic diversity to breed healthy tigers, sperm from all 140 male tigers in the United States is being collected. Their samples are then placed in cryopreservation in a genome resource bank located at the Zoo to be used later for artificial insemination. These samples can be stored in liquid nitrogen for more than 100 years and can be easily transported to zoos around the world. While conservation’s first priority is always to save animals in the wild, if tigers do go extinct in their natural habitat, the Tiger Genome Project may be able to reintroduce them back into the wild. In the meantime, teams are conducting research on how to increase the success rates of artificial insemination in tigers, which has never been done with frozen sperm. Another priority of the Tiger Genome Project is to identify infertile males who can then be excluded from the breeding population. Omaha’s Henry Doorly Zoo and Aquarium has a long history with tigers, and its research staff are considered experts in feline reproduction. Together with the Association of Zoos Aquariums, we look forward to breaking new ground in this field of research and creating success to keep one of the world’s most favorite animals thriving.